With three months until the official kickoff of summer, Oyster Bay Town Supervisor Joseph Saladino and Councilman Steve Labriola announced that family-beachgoers will enjoy an upgraded spray park and new marina playground this coming season. These new amenities, together with new restaurants and concession offerings, free Wi-Fi access and mobility mats, will further enhance TOBAY Beach as a premier destination in the Town of Oyster Bay. 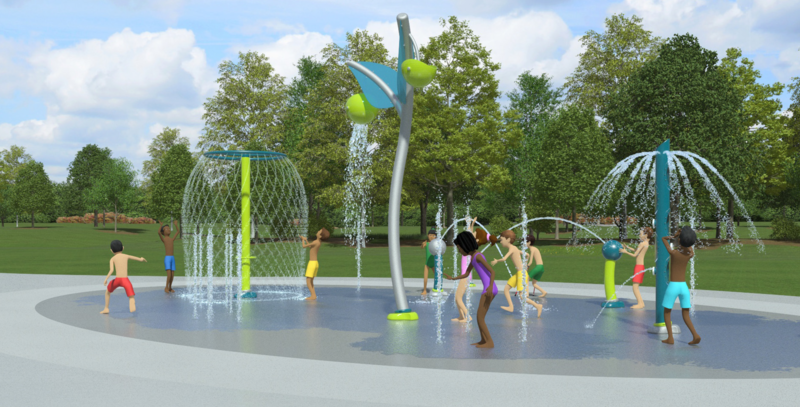 The new spray park will feature a green jungle frog which emits a fan spray of water from its mouth, randomly dumping water buckets, cascading water features, spinning spheres of streaming water, an interactive water table, multiple streams of water spouts, random staggering heights of water, safety surfacing and sunshades. This new amenity will replace the current spray park that had become dilapidated from sun and saltwater. The current playground within the spray park will also be improved with new paint, equipment and sunshades. In addition to the playground near the spray park, a new playground has been installed near the marina. This new marina playground features multiple slides at various heights suitable for children of all ages, wall climbing elements, bridges, swinging/hanging elements and multiple climbing features. This new playground welcomes children of all ages. From Saturday, June 22nd through Labor Day, all Town beaches will be open for the season seven days a week. Beginning Saturday May 11th, residents can take part in early beach sticker sales 7 days a week at TOBAY Beach, John J. Burns Town Park in Massapequa, and Theodore Roosevelt Memorial Beach in Oyster Bay, from 10 a.m. until 2 p.m. Beginning Saturday, June 22nd, stickers are available for purchase at all Town beaches from 8AM-4PM except TOBAY Beach where stickers are available until 5PM. To purchase a resident beach sticker for your vehicle, residents must present their vehicle registration and bring the vehicle they plan to drive to the beach since stickers are placed directly on the vehicle at the time of purchase. Only Town residents may purchase beach stickers for Town of Oyster Bay Beaches. Seasonal stickers are $60, which pay for themselves following three visits. Residents aged 60+ qualify for a Senior Beach ID at the Town Clerk’s Office for a one-time fee of $32. Additionally, volunteer firefighters, U.S. Coast Guard members, Armed Forces service members, and veterans all qualify for seasonal beach passes at reduced rates. For more information, contact the Beach Division of the Town of Oyster Bay Parks Department at (516) 797-4111.